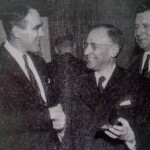 The United States’ Sister Cities Program grew from President Dwight D. Eisenhower’s 1956 initiative to enlist thousands of volunteer citizens to act as diplomats in a quest for world peace. This “people-to-people” program was created to encourage Americans to communicate with people around the globe and for communities to bond together by engaging in projects that are mutually beneficial. 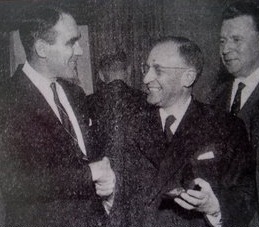 Rochester joined the mission of citizen diplomacy in 1958 when former mayor Peter Barry signed the city’s first sister city agreement with the mayor of Rennes, France Henri Fréville, left. International Sister Cities of Rochester is governed by its Board of Trustees and the Mayor as its honorary chair. The Board includes the chairperson of each sister city committee, elected officials and other individuals who are active or have an interest in the international arena. Rochester Sister Cities cooperates with its sister cities and other international organizations in the Rochester region to provide mutual resources that benefit our community. To benefit the Greater Rochester community and its sister cities around the world through the establishment and support of long-term, mutually advantageous partnerships. Encourage tourism and travel to and from our Sister Cities worldwide. Help bridge Rochester to the world by supporting our efforts to facilitate educational, cultural, humanitarian and business exchange.